Desalination using reverse osmosis (RO) membranes is a sustainable technology success story that disrupted the status quo by driving down water production costs relative to energy inefficient incumbent technologies. "If we could ever competitively, at a cheap rate, get fresh water from salt water, that it would be in the long-range interests of humanity which would really dwarf any other scientific accomplishments." Perhaps spurred on by President Kennedy, the development of mass producible RO devices in the late 1960’s led to a “membrane revolution” in the field of desalination that ultimately replaced existing energy inefficient equipment on a massive scale. Fundamentally, the roots of this membrane revolution lie in the ability of membranes to operate with an efficiency approaching that of the thermodynamic limit. Indeed, in the case of salt water purification, the thermodynamic separation energy requirement is 1 kWhr/m3, which can be compared to membrane systems that have a real energy cost of ~4.0 kWhr/m3 and “thermal” purification methods that require ~50 kWhr/m3. However, the desalination industry pales in comparison to the refining and petrochemical industries in terms of size, energy consumption, greenhouse gas emissions and waste output. Indeed, these two industries alone annually consume 11% of the U.S.’s produced energy! These industries require large-scale thermally-driven separation processes (e.g., distillation); these separations account for roughly 45% of the energy consumed by these industries. Our goal is to translate the concepts of aqueous RO to the separation of hydrocarbon and industrial chemicals to replace incumbent thermal separation technologies to achieve similar 10x reductions in energy and carbon intensity. Our approach is to design, engineer and utilize nanoporous materials as entities capable of selectively removing one or more components from a mixed component feed. We specifically tailor these nanoporous materials to enable a separation based on differences in each components diffusivity, solubility or both within the nanoporous material. A key defining feature of our lab is our multi-layer fiber spinning approach capable of translating the exceptional properties of nanoporous materials into actual separation devices. Multi-layer composite fiber spinning is a potentially disruptive materials processing technique that allows for multiple advanced functional materials to be directly integrated into fibers at low costs. This allows our team to rationally design fiber architectures that introduce functionality where it is needed most (in contrast to bulk functionalization of the fiber), thus driving down costs. Moreover, the multi-layer fiber architecture allows for the fibers to become multi-unit integrated devices. For instance, we have demonstrated that hollow fiber sorbents may be used as "adsorbing heat exchangers" when an impermeable barrier layer is installed on the lumen-side of the fiber. Through the use of a heat transfer fluid in the bores of the fibers, the hollow fiber sorbent unit can remain isothermal even during intense sorption enthalpy release. Reverse Osmosis – a process by which a solvent passes through a porous membrane in the direction opposite to that for natural osmosis when subjected to a hydrostatic pressure greater than the osmotic pressure. Hollow fiber spinning – A technique for creating polymeric hollow fiber structures. The polymer and another fluid are extruded through a co-annular die into a quench bath to form the hollow fibers. Hollow fiber sorbents – A hollow fiber architecture with the walls of the fiber loaded with porous particles. These fibers are typically co-spun with a barrier layer. 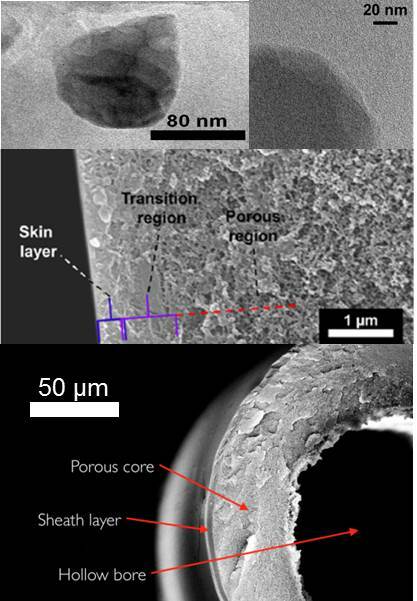 Asymmetric hollow fiber membranes – Typically a pure polymer hollow fiber membrane with a radial gradient in pore size that terminates in a dense polymer skin layer (the membrane). Mixed matrix membranes – A membrane comprised of two solid phases, typically a polymer phase and a nanoporous particle phase. Combines the processability of polymers and the separation efficiency of nanoporous materials. Metal-organic framework – Nanoporous materials comprised of metal ions or clusters coordinated to organic molecules to form one-, two-, or three-dimensional structures. Typical polymers: Cellulose acetate, polysulfones, polyimides.